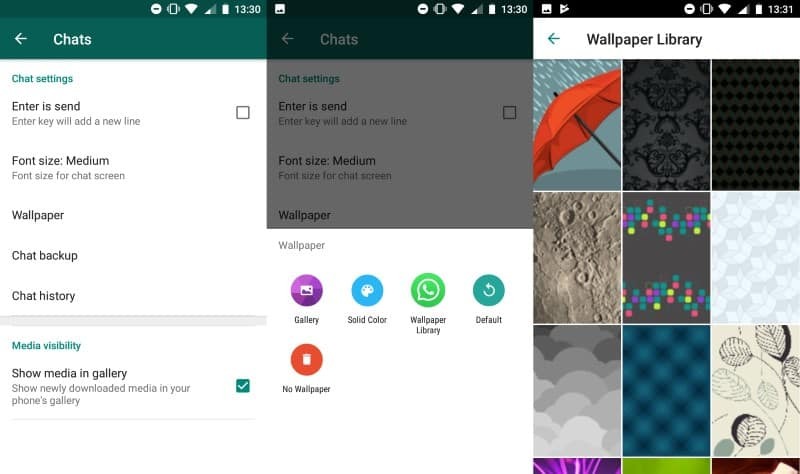 The following guide walks you through the process of changing the wallpaper of the popular messaging software WhatsApp. While many users of the messaging application know about the possibility of changing the wallpaper of the interface already, there are still many who don't know about it. You could change the default interface color to a photo of your loved ones, any other photo, a solid color that you prefer over the default, or one of WhatsApp's official wallpapers. WhatsApp comes with capabilities to change the default background of the chat interface to any image that is on the phone, a solid color, a selection of official wallpapers by WhatsApp, or no wallpaper at all. Open WhatsApp Messenger on your device. Select Menu > Settings if you are on the home screen. Go to Chats > Wallpaper. Select gallery to set any photo that is on the device as the wallpaper. Other options include selecting a solid color, or no wallpaper. Wallpaper Library is special as it is an add-on that you need to install before the designs become available. These designs are optimized for WhatsApp and can be applied as backgrounds just like any other image. WhatsApp displays a preview so that you know how the chat looks like when you apply the new wallpaper. Some images are not well suited as background images as they may add too much noise to the interface or make it difficult to concentrate on the text in the chat interface. Note that you can also set the wallpaper when a chat is open. Just tap on the menu icon and select wallpaper to get to the same dialog. The wallpaper is set for the entire interface, there is no option to use different wallpapers for individual contacts. The wallpaper is only visible on your device, it is not visible to contacts unless you happen to share a screenshot of the interface.